Individually wrapped seedlings are selected for shipment when they reach a height range of 6-12”. The seedlings have a well developed root system (4” length by 1” diameter) incorporated soil provides protection for shipping and storing for a short time. The seedlings are shipped in a clear plastic 15”x11/2” bag printed with planting instructions. Our seedlings are not bare root. Refer to the seedling page for the varieties we offer. We also burlap wrap the seedlings with raffia. These little darlings are encased in a plastic bag with planting instructions they look like miniature balled and burlap trees. We offer centerpieces for any event. We provide individually wrapped and burlap wrapped seedlings for all events. 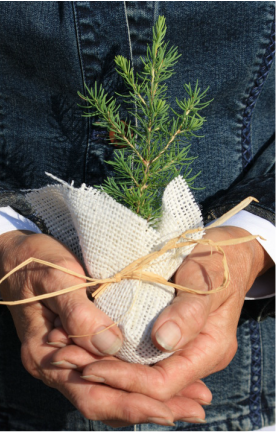 Our seedlings have been used to promote businesses at trade shows and special events such as arbor day and earth day. Weddings are a favorite for us. We love talking to brides and family members as they plan for their big day. My advice is always enjoy the planning as the day flies by. Let us help you by supplying that extra touch of forever to your wedding day. We have provided seedlings to use as a special remembrance for memorial services.